RALEIGH, N.C. — The North Carolina Democratic Party filed a formal complaint Wednesday against U.S. Sen. Thom Tillis and the state Republican Party over work performed by Cambridge Analytica. Cambridge Analytica is the British-based firm that ex-employees allege vacuumed up data from tens of millions of Facebook users to influence the 2016 presidential race for Donald Trump. The firm, which announced later Wednesday that it is declaring bankruptcy and shutting down, also was paid by the Tillis campaign and the state GOP for work in the 2014 elections, according to campaign finance reports. State Democrats allege in their Federal Election Commission complaint that Tillis’ campaign and the state Republican Party violated the law because Cambridge Analytica employees were foreign nationals who helped make key campaign decisions. Cambridge’s website says the company’s “unique data-rich voter file” was used to build high-tech profiles for all North Carolina voters and increase turnout, helping Tillis unseat Democratic Sen. Kay Hagan. The complaint also accuses the Tillis campaign and the state GOP of receiving illegal contributions from a super PAC led by John Bolton — now Trump’s national security adviser — that also used Cambridge Analytica in pro-Tillis campaign activity. The Bolton PAC spent nearly $1.4 million backing Tillis in the race, according to the Center for Responsive Politics. “Protecting the sanctity of our elections is paramount and any violations must be rooted out and punished to curb future efforts to undermine our elections,” state Democratic Party Chair Wayne Goodwin said in a news release. Tillis’ campaign and the state GOP call the allegations untrue. In 2014, Cambridge Analytica received $150,000 from the state Republican Party and $30,000 from Tillis’ campaign, campaign finance reports show. 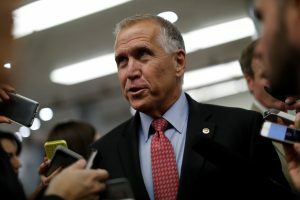 Both the GOP and Tillis downplayed the firm’s role; Woodhouse described it as one of many direct-mail vendors that provided no social media work.